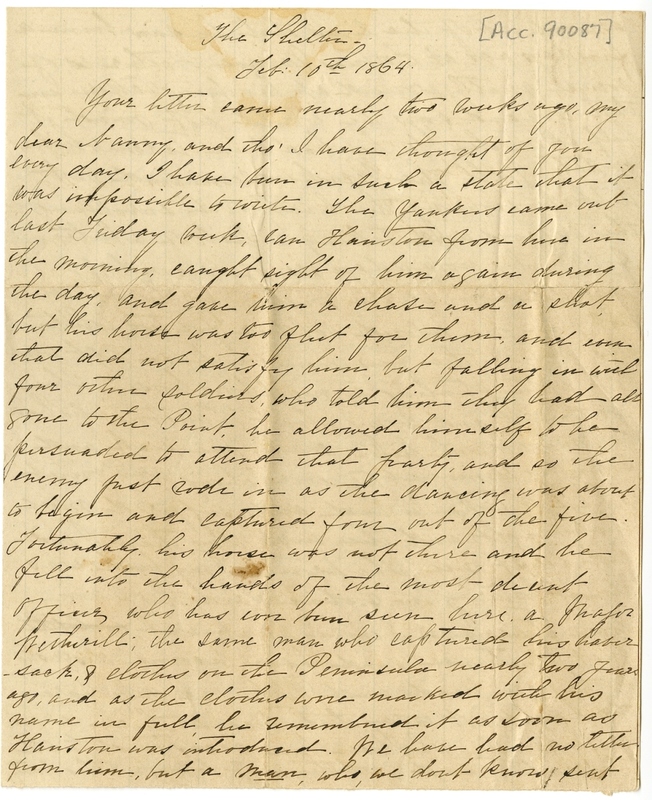 Item Description: Letter, dated 10 February 1864 from Louly Seawell to her cousin Nanny from “The Shelter.” The letter describes the capture of Nanny’s brother Hairston Watkins, who was held at Point Lookout, Maryland. Louly also describes the enrollment of African American soldiers and treatment of prisoners of war. Item Citation: Folder 8 of the George Hairston Papers #04477, Southern Historical Collection, Wilson Library, University of North Carolina at Chapel Hill. 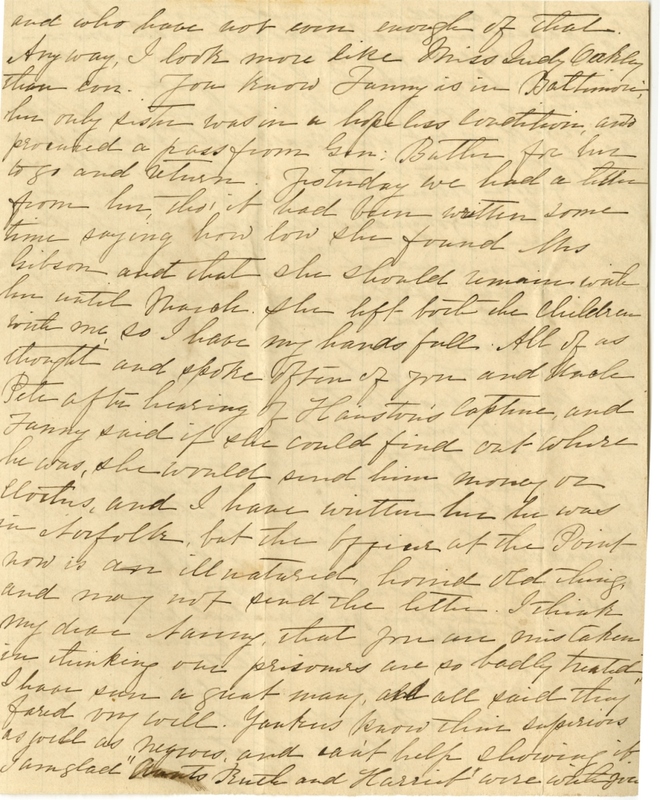 Your letter came nearly two weeks ago, my dear Nanny, and tho’ I have thought of you every day, I have been in such a state that it was impossible to write. The Yankees came out last Friday week, [can?] Hairston from here in the morning, caught sight of him again during the day, and gave him a chase and a shot but his horse was too fast for them and even that did not satisfy him but falling in with four other soldiers, who told him they had all gone to the Point, he allowed himself to be persuaded to attend that party and so the enemy just rode in as the dancing was about to begin and captured from out of the fire. 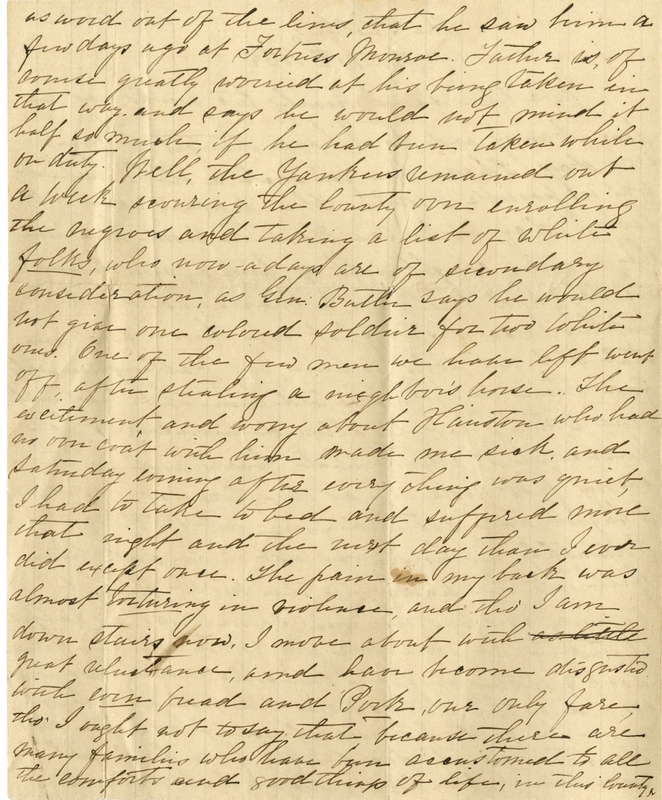 Fortunately his horse was not there and he fell into the hands of the most decent officer who has ever been seen here a Major Wetherill, the same man who captured his haversack, and clothes on the Peninsula nearly two years ago, and as the clothes were marked with his name in full, he remembered it as soon as Hairston was introduced. We have had no letter from him, but a man who, we don’t know sent us word out of the lines, that he saw him a few days ago at Fortress Monroe. Father is, of course great worried at his being taken in that way and says he would not mind it half as much if he had been taken while on duty. Well, the Yankees remained out a week scouring the county over enrolling the negroes and taking a list of white folks who now-a-days are of secondary consideration, as Gen Butler says he would not give one colored soldier for two white ones. One of the few men we have left went off after stealing a neighbor’s horse. The excitement and worry about Hairston who had no over coat with him made me sick and Saturday evening after everything was quiet, I had to take to bed and suffered more that night and the next day than I ever did except once. The pain in my back was almost torturing in violence, and tho’ I am down stairs now, I move about with great reluctance, and have become disgusted with even bread and pork. our only fare tho’ I ought not to say that because there are many families who have been accustomed to all the comforts and good things of life, in this county, and who have not even enough of that. Anyway, I look more like Miss Judy Oakley than ever. You know Fanny is in Baltimore, her only sister was in a hopeless condition, and procured a pass from Gen. Butler for her to go and return. 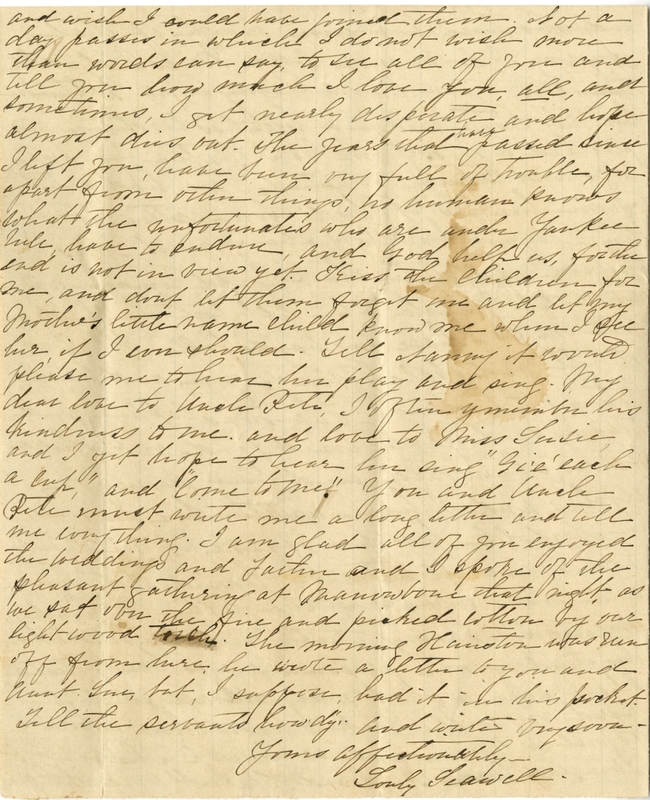 Yesterday we had a letter from her, tho’ it had been written some time saying how low she found Mrs. Gibson and that she should remains with her until March. She left both the children with me, so I have my hands full. All of us thought and spoke often of you and Uncle Pete after hearing of Hairston’s capture, and Fanny said if she could find out where he was, she would send him money or clothes, and I have written her he was in Norfolk but the 0fficial at the Point now is an ill natured, horrid old thing, and may not send the letter. I think my dear Nanny, that you are mistaken in thinking our prisoners are so badly treated I have soon a great many and all said they fared very well. Yankees know their superiors as well as negroes and can’t help showing it. I am glad Aunts Ruth and Harriet were with you and wish I could have found them. Not a day passes in which I don’t wish more than words can say to see all of you and tell you how much I love you all, and sometimes I get nearly desperate and hope almost this out. The years that have passed since I left you, have been very full of trouble, for apart from other things, no human knows what the unfortunates who are under Yankees rule have to endure, and God help us, for the end is not in view yet. Kiss the children for me, and don’t let them forget me and let my Mother’s little name child know me when I see her if I ever should. Tell Nanny it would please me to hear her play and sing. My dear love to Uncle Pete, I often remember his kindness to me and love to Miss Susie and I yet hope to hear her sing “Git each a cup” and “Come to me.” You and Uncle Pete must write me a long letter and tell me everything. I am glad all of you enjoyed the weddings and Father and I spoke of the pleasant gathering at Manowbone that night as we sat over the fire and picked cotton by our lightwood table. The morning Hairston was seen off from here he wrote a letter to you and Aunt Loui, but, I suppose had it in his pocket. Tell the servants howdy and write very soon. This entry was posted in Southern Historical Collection and tagged African American soldiers, point lookout. Bookmark the permalink.